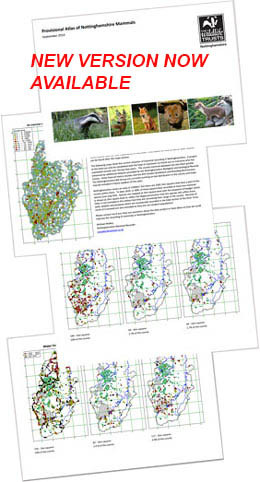 Putting Nottinghamshire's mammals on the map! Many species are extremely under recorded and their distributions in the county are therefore poorly known. We assume that many species are common but there is no evidence to prove this so infact some species may not be as widespread as we perhaps suspect. Some species are of particular conservation concern, e.g. Water Vole and Harvest Mouse, and are known to be declining. For other species, such as water shrew, we just don't have enough data to know their status in the county. Your records are extremely important and will help to give us a much clearer picture of Nottinghamshire’s mammal distribution and will enable the production a full atlas of all our species in the next few years. The information will help us to target conservation action to conserve our species and, hopefully, to bring our most vulnerable species back from the brink. The data will also help to identify areas which are suitable for designation as Local Wildlife Sites for their importance to mammals. The maps on this website show the current situation of mammal recording in Nottinghamshire. A project of this kind can only be completed with the help of volunteers so thank you to everyone who has submitted records over the last few years. The county mammal database has also been greatly enhanced by additional datasets provided by the Nottinghamshire Biological and Geological Records Centre, Sorby Natural History Society and the BTO Garden BirdWatch and Breeding Bird Surveys.